How did I get started with photography? Growing up my parents enjoyed photography as a hobby, and we had a shelf of family albums I loved to thumb through. 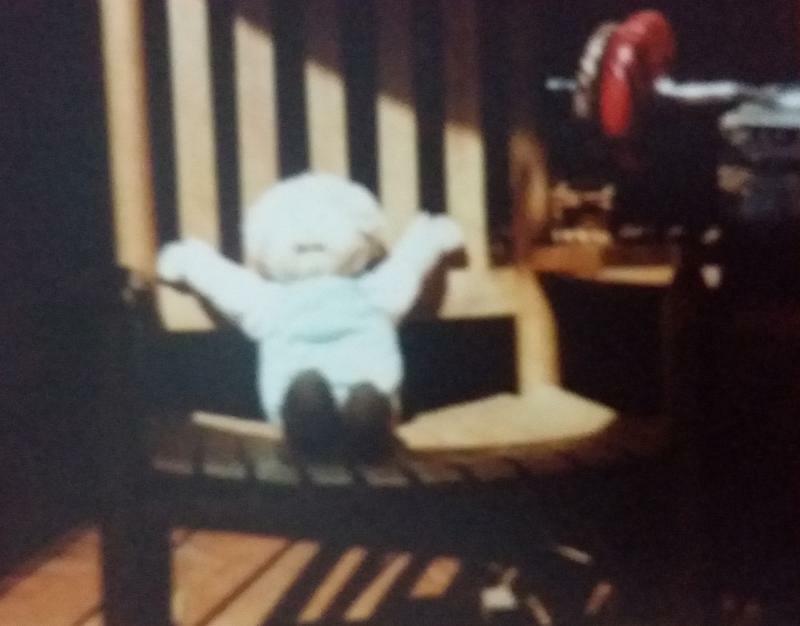 I don't remember when I was first invited to use the camera, but I do remember using it as a 9 year old to photograph my beloved Cabbage Patch Dolls. I would pose them, taking time to set it up just so, which was quite a balancing act. I enjoyed doing this! My father in particular really encouraged me in this area. 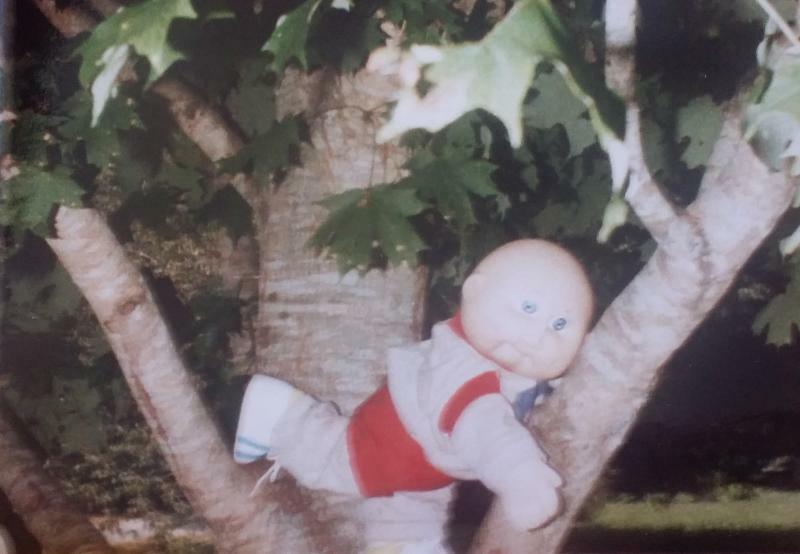 Here is is humoring me that my doll is real and climbing the vine... 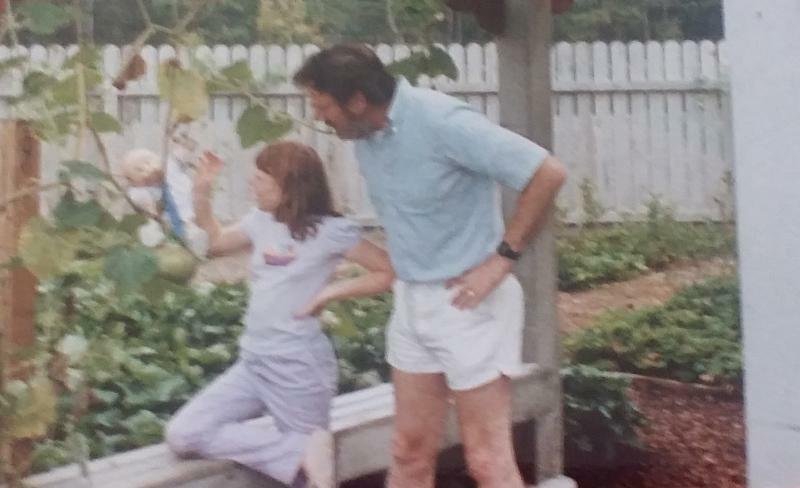 I feel so grateful for all the love and encouragement I received as a child for my artistic ambitions. 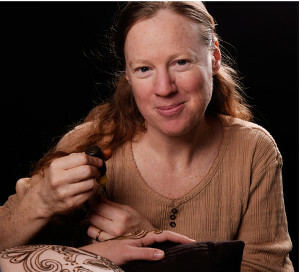 Stacey has come for several henna sessions and it's always a pleasure to she her and hear the amazing stories she always has. She met her beloved while snowboarding and now her baby girl is learning snowboarding so they can do it as a family! Amazing. Each of her henna designs has incorporated hearts and the infinity sign, this henna also includes lots of pretty flowers and swirls. 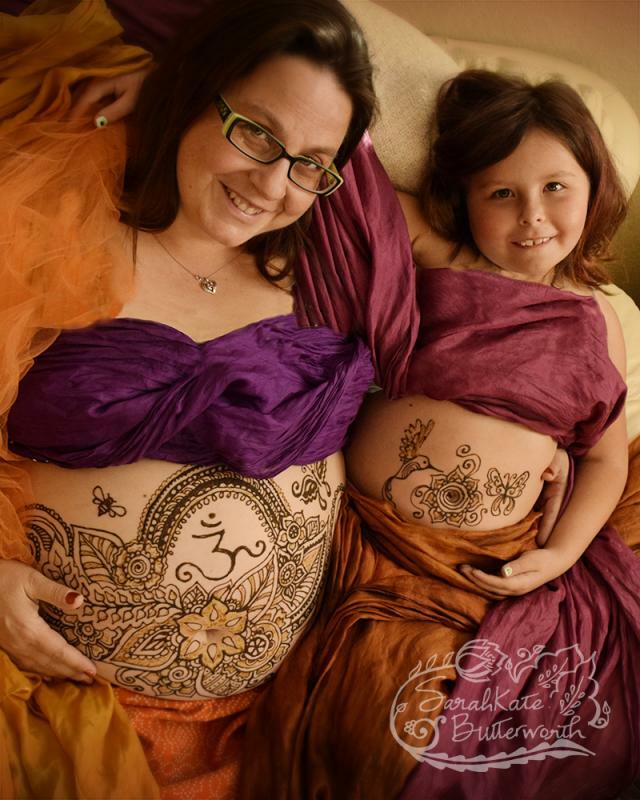 I first met Amy in 2008 to celebrate her pregnancy, where she requested paisleys and an OM. 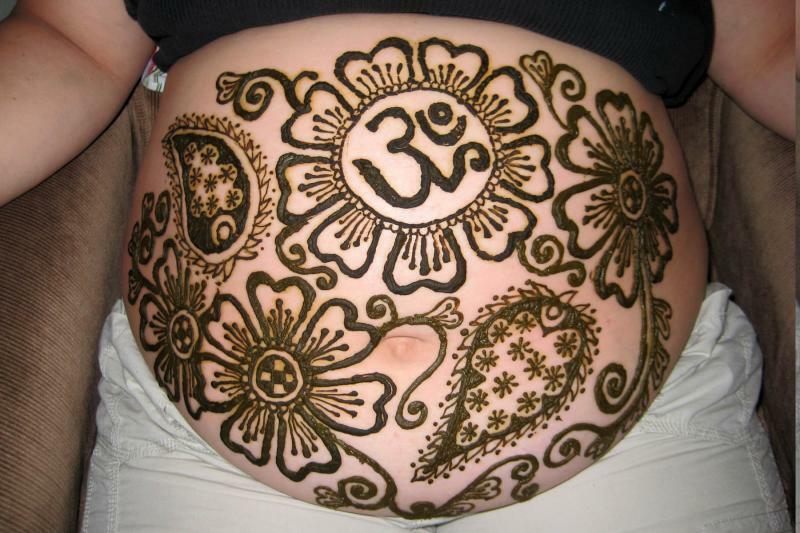 When I look back at this henna belly from 7 years ago I am amazed at how far I've come since then! 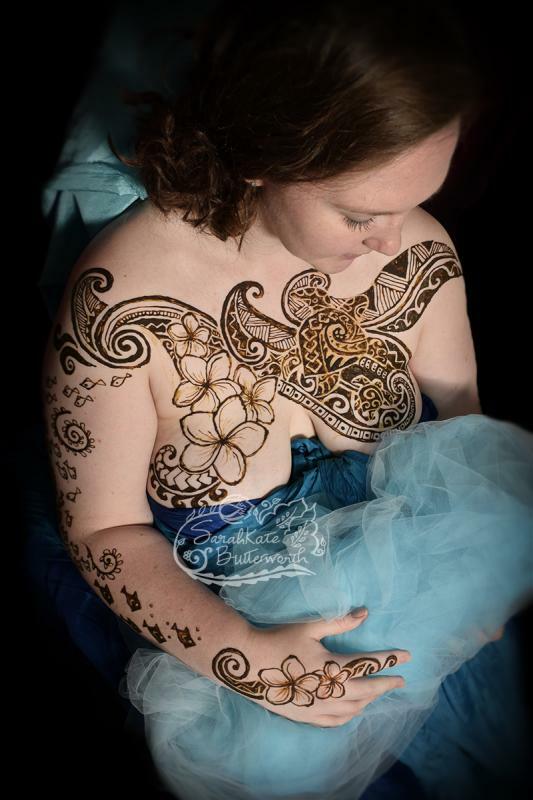 Here's the henna I did for her baby shower in Louisville this fall (below). Of course, another OM, along with a butterfly and bee. This belly has a rainbow as this is Amy's rainbow baby (which was born recently and is doing great!). 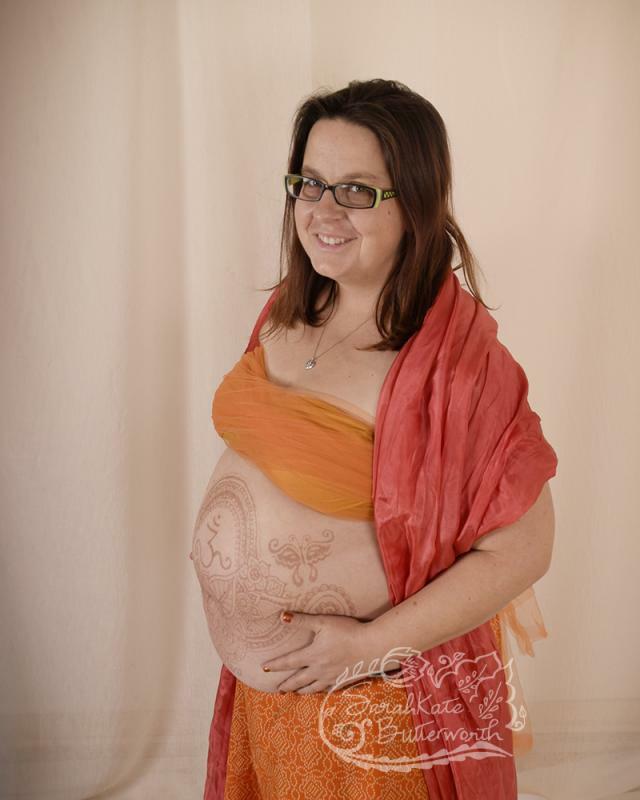 The other belly pictured here is of her daughter, who wanted a flower around her belly button with a butterfly on one side and a humming bird on the other. 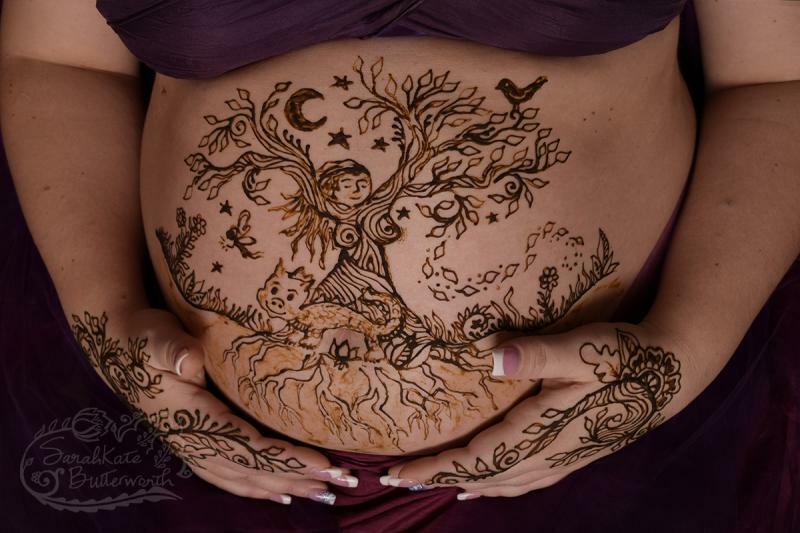 It's so very sweet to paint BOTH the mother and daughter in celebration of this new life on the way. 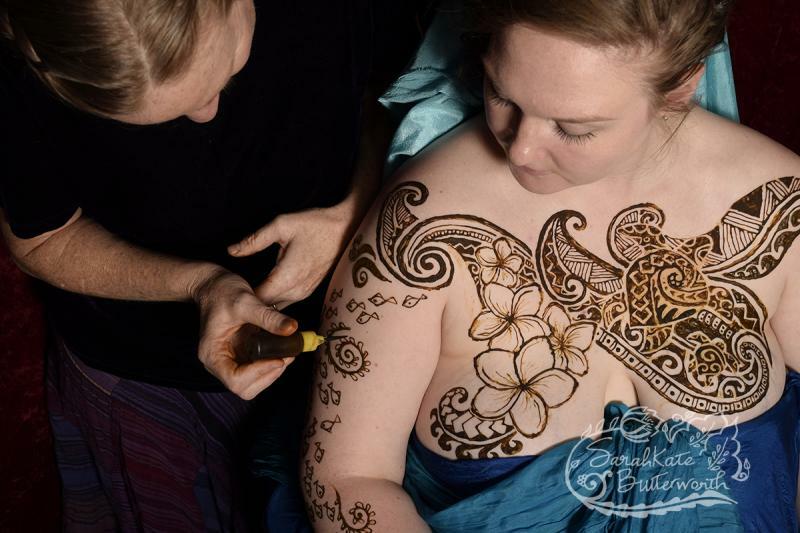 Amy and her family returned to my studio in Boulder just a few short days later, to capture the henna when it was peaking in color. Beautiful! 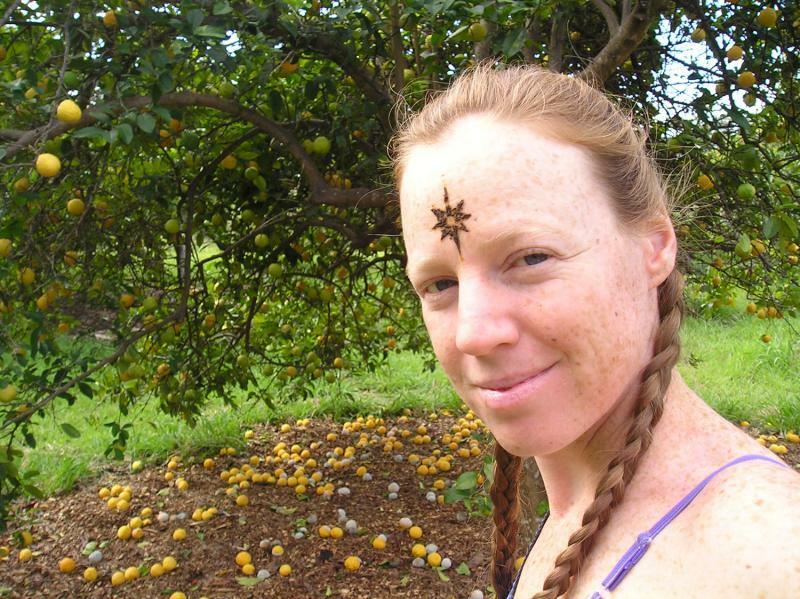 12 years ago, on the beautiful Big Island of Hawaii, I began my journey as a henna artist. I'd moved from my hometown of Boulder, Colorado to spend time working on a farm & nannying on the Big Island, and after 2 years I'd developed a lot of friendships. I treasured these times, when I opened up to allow such friendships with a group of loving women - we'd swim out to see the dolphins together, we'd dance together and sing together. I loved it, I had never expereinced "sisterhood" like this. 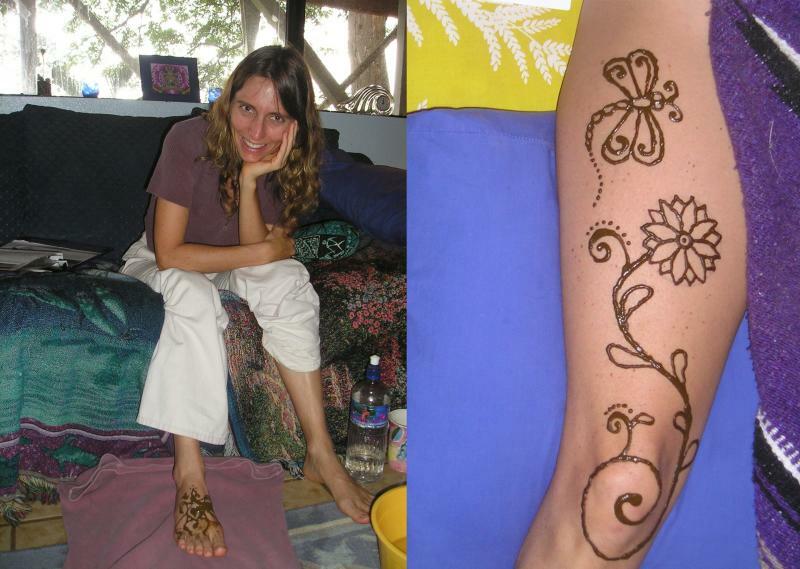 One day I suggested a henna party on the beach, and they all agreed. I skimmed the instructions from the henna kit I bought from the craft store, skipping past the part about henna having to sit for 6 hours after you mixed it up. Also, I missed reading the part about not getting it wet for the first 24 hours. No matter. We all met at the beach and painted all over each other. In this photo, I am gazing up at my best friend Coral who is adorning my head. Afterwards, I got up and painted her. 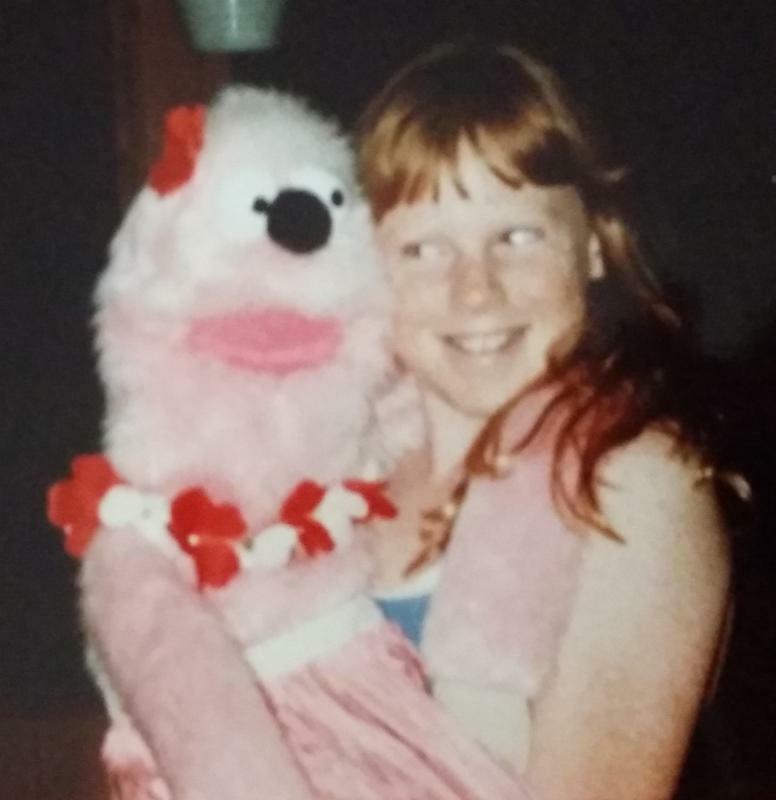 This was a powerful rite of passage into womanhood for me. I remember this day, how we all just did the best we could with this new medium that came out a bit unexpectedly and made sudden splotches. We laughed and talked and dried in the sun. 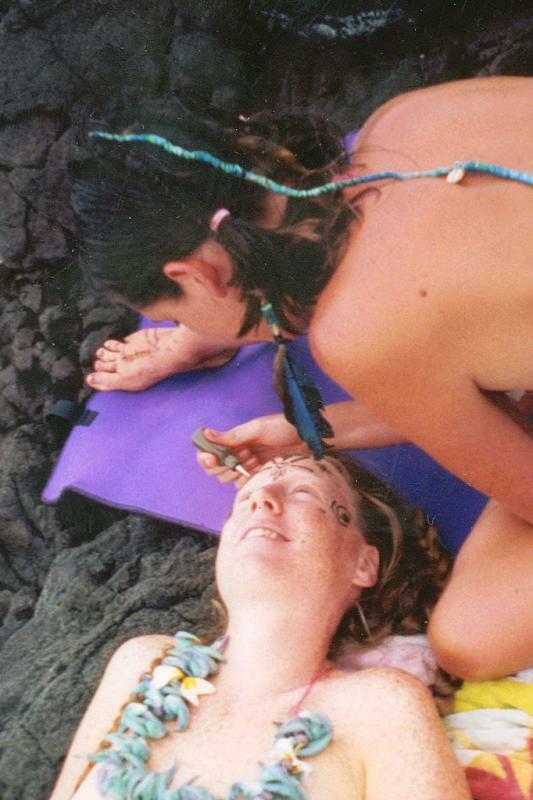 When we got hot, we jumped in Kealakeua Bay and rinsed the henna off. Obviously it didn't stain very well at all, but it lit a fire in me. I kept the henna kit and played with the remaining paste. It was then I realized that I had finally found my medium! 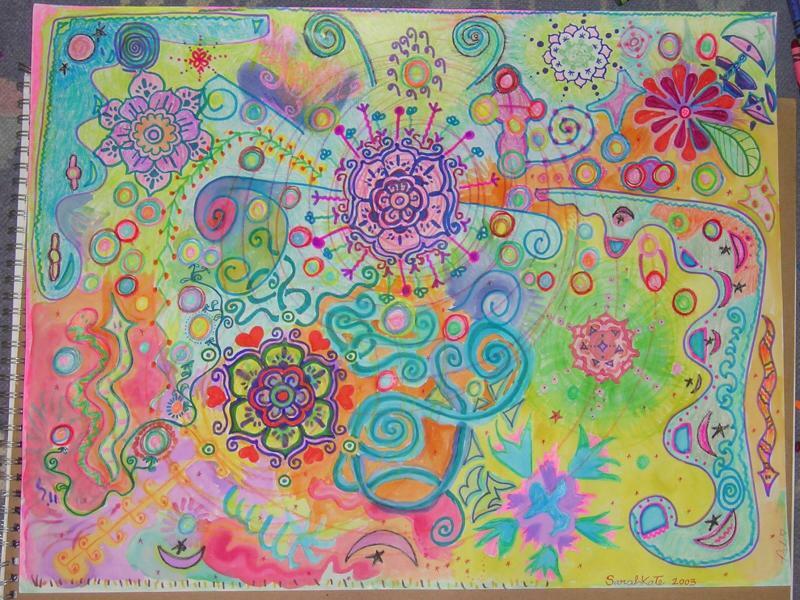 I had been wandering as a casual artist, a doodler really.... and knew I loved creating art but I wasn't gifted at any particular medium. Until now. I felt it. When the henna ran out, I ordered from another supplier and while I waited, another dear friend, Pati, and I drew henna designs with markers and created this work of art. When the henna arived, I mixed it up and started painting again. There was so much to learn, and I had no teacher, no videos to watch. Just the instructions from the kit. One time the henna tube was blocked so I squeezed and squeezed until POP out it came, completely splotching the design. Thankfully Pati just laughed it off and let me practice on her some more. I bought the very basic henna design books, printed them out and practiced the designs on as many people as I could. Everyone was so encouraging and complimented me on my artwork, which kept my spirits up. Slowly my lines became cleaner and my confidence grew. I knew I was meant to be a henna artist and I loved the feeling I got when I created art that was immediately worn & enjoyed. 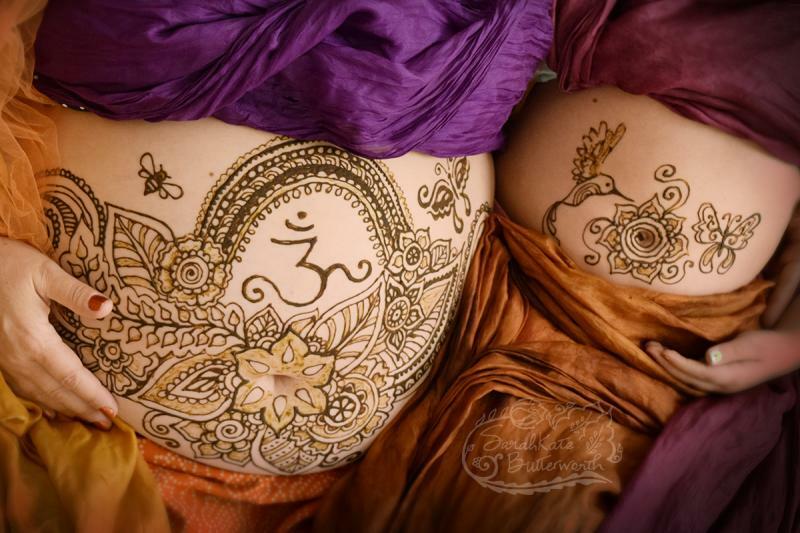 Another friend of mine came back from the wet side of the island pregnant, and we gave her a special blessing way. 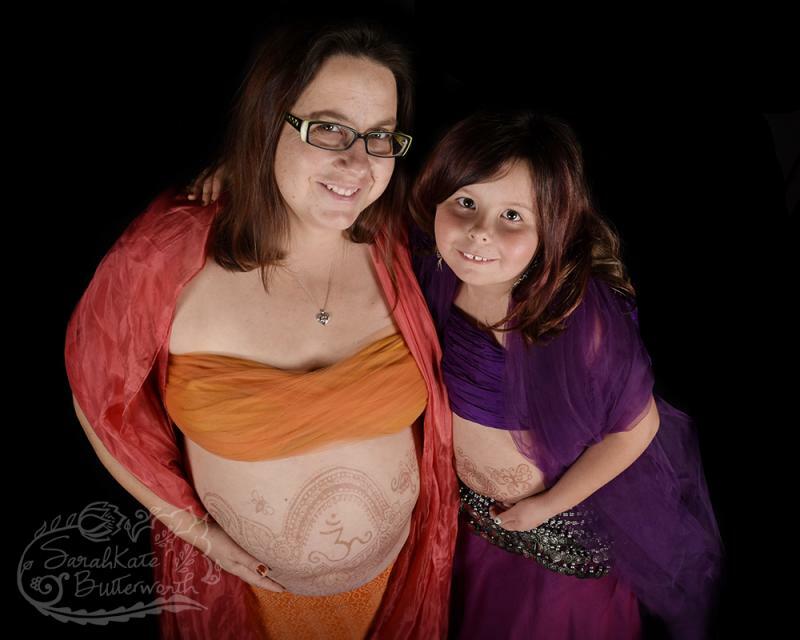 I was beyond excited to adorn her belly. I don't think any of my design books had belly patterns in them, so I just winged it. She was thrilled. This photo was taken right around my 30th birthday, in 2004. I love exploring new ways to create flowers! 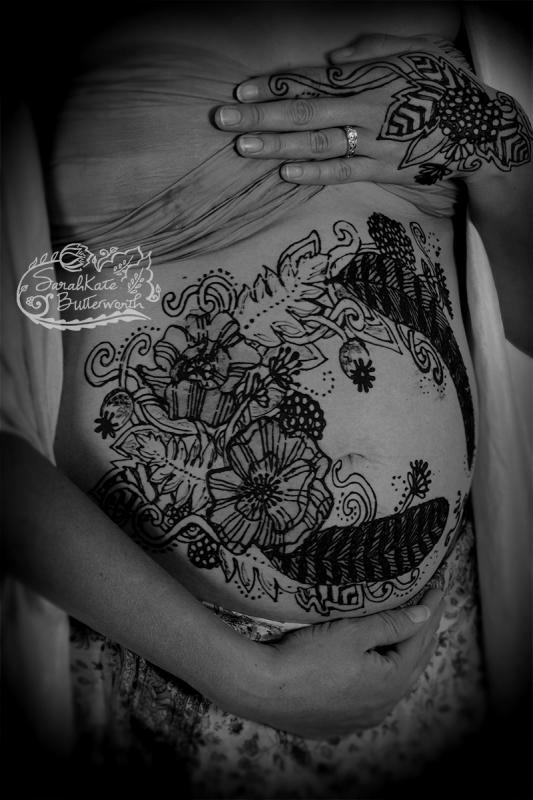 Here we have lots of poppies, feathers and berries incorporated into the henna tattoo to honor Elizabeth's pregnancy. 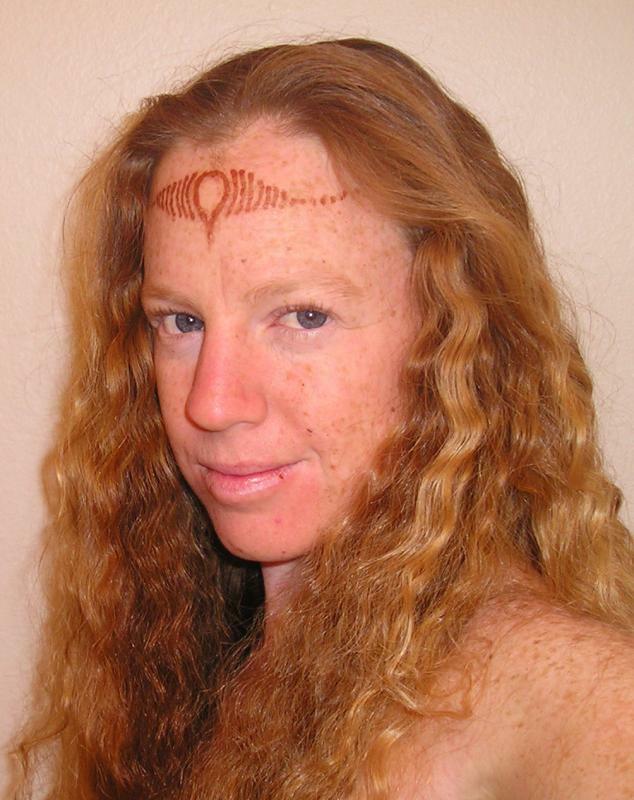 It was a cold, cloudy morning in Boulder Colorado when we met to take photos of her peaking henna stain. I love the golden leaves.... Elizabeth you are glowing! l love hear the stories behind all the symbols.... Dorian has spent a lot of time in Hawaii and the turtles had special meaning to her. 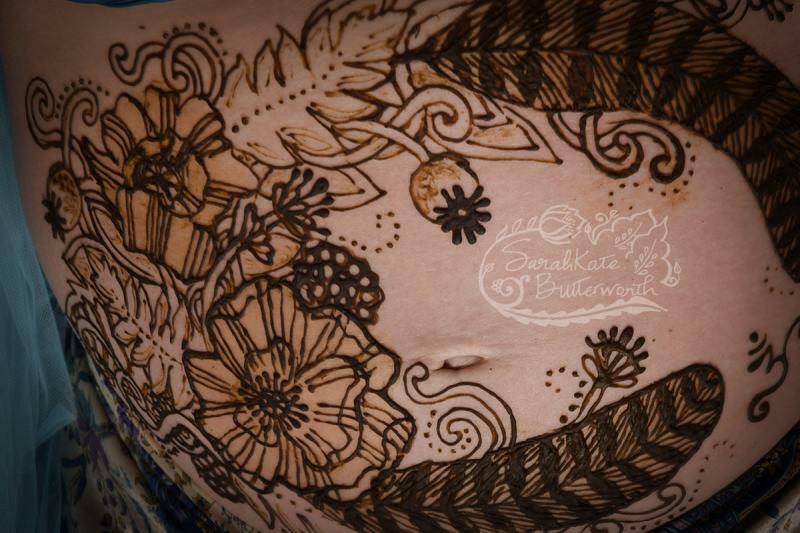 This henna tattoo has a watery - Polynesian theme, just beautiful with the plumeria flowers floating by... 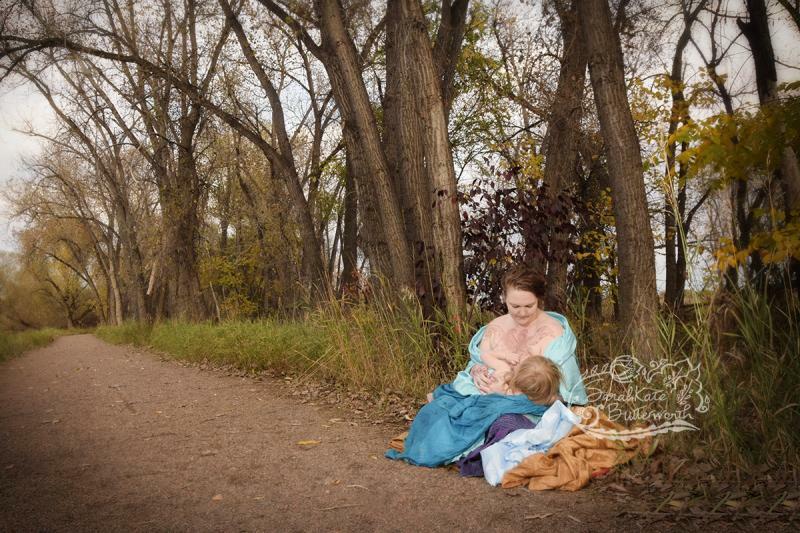 Here I am putting in the last little fishes.... Dorian returned a few days later for breastfeeding photos beside Boulder Creek. I love this time of year! 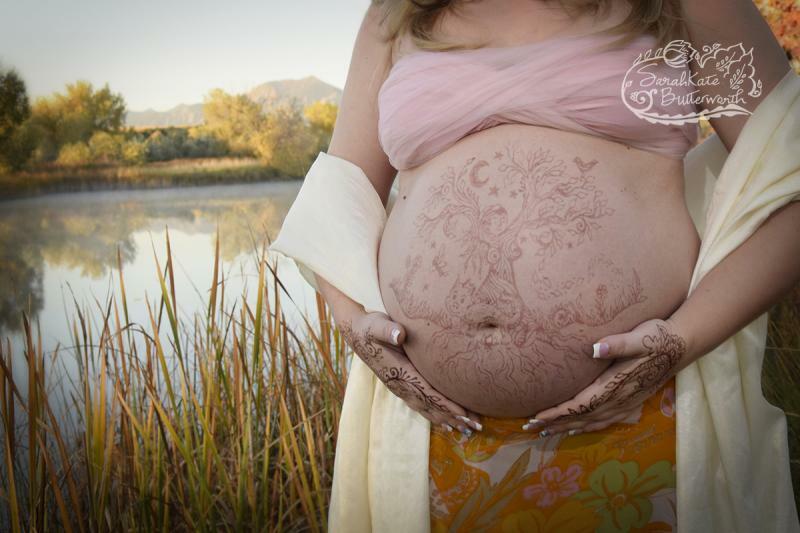 This gorgeous mama drove from her home in Avada to my studio in Boulder for a henna belly session. After some discussion on the tattoo design, I began painting. Over the course of 1 1/2 hours I incorporated as many symbols as I could - a goddess as a tree, a baby dragon, a fairy and blowing leaves. I love how it came out, henna with a playful feeling. 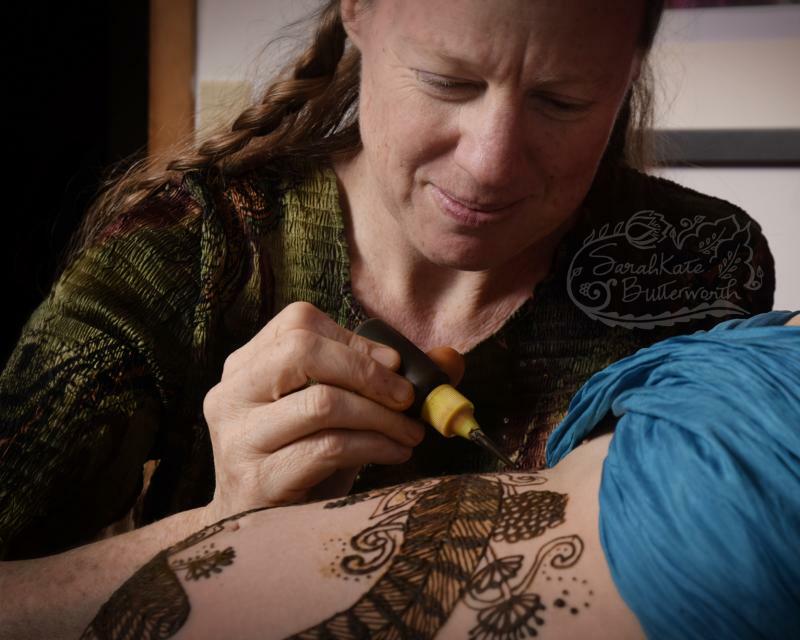 Amber returned just a few days later at sunrise to capture these amazing photos of her henna tattoo with the sun lighting up the Colorado mountains. She is glowing with love .... a beautiful mama-to-be.